You find Caviar House & Prunier in Switzerland, France, UK, Denmark, Germany, Dubai, Austria and Hong Kong. 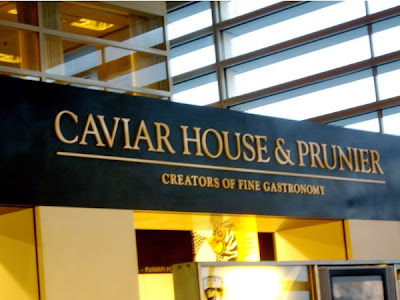 Caviar House & Prunier is one of the best places to enjoy a pre departure snack at Copenhagen Airport. Here you may order first class seafood and champagne to follow. Afterwards you may consider some of the delicious products under offer, but beware - the price is first class as well, so pay up! In February we did just that. 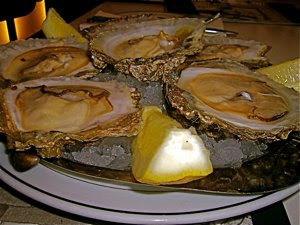 What could be better than a plate of large succulent oysters served on ice with just lemon to squeeze over. So fresh, so natural, no artificial colour, flavour, or additives - 100 % natural!! Then a plate of Balik Salmon. 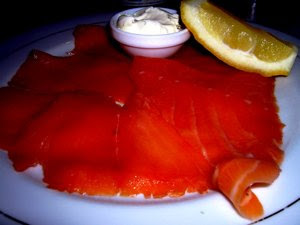 This product has undergone a smoking process going back to the time of the Russian Tsars After being specially salted and raffia dried to massage the flesh, the salmon is smoked gently for twenty hours in a one-off process. The Salmon is then sliced by the skilled hands of filleting specialists, then sorted and labelled. Did it meet my expectation of a truly spectacular product? Not really. It was delicious, but I have enjoyed several similar salmon qualities earlier. And what could be better than a bottle of bubbly. 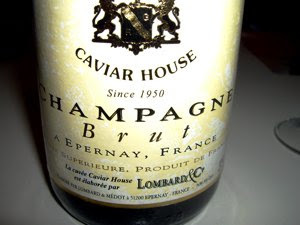 The Caviar House & Prunier had their own label of Champagne, dry and delicious, produced by the Champagne House Lombard & Cie in Epernay. Food for you eyes - only.....? What is the catch of the day - monsieur?